Can’t get your team to eat enough vegetables? 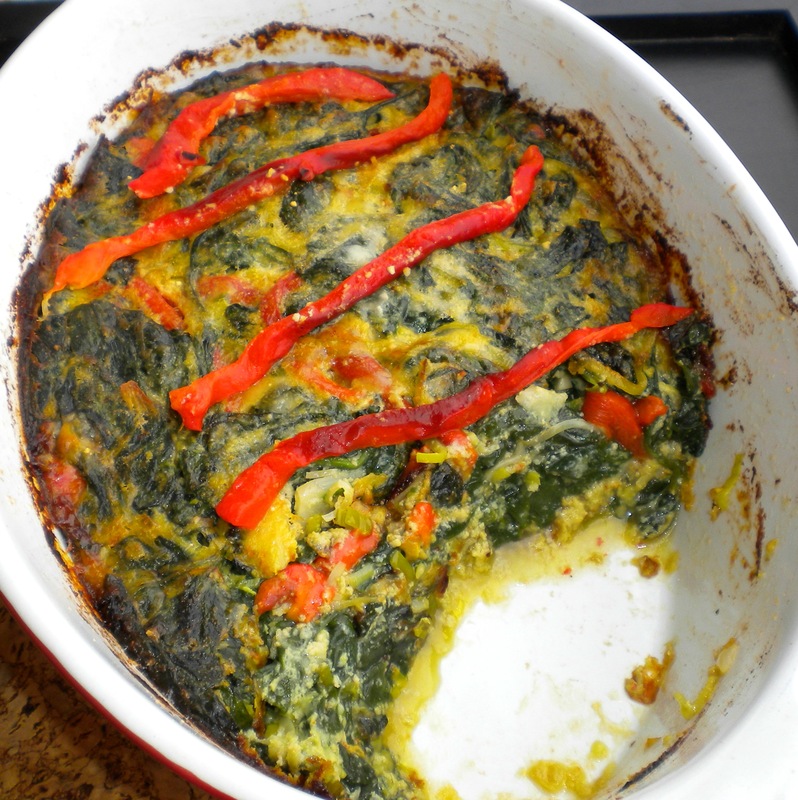 Try this gratin of fresh spinach, leeks and roasted red peppers that’s baked with just the right amount of cheese to make it more tempting than the usual pile of unadorned greens. Turn it into a complete vegetarian meal by piling it into a pastry case before baking and call it ‘quiche’- in which case I’d recommend sprinkling extra Parmigiano on top; otherwise it’s an ideal accompaniment to just about any meat or chicken dish. A shortcut: use those peeled, fire-roasted peppers that you get in jars from the supermarket….they’re almost as good as the ones you’d grill yourself. You can make it ahead up to the point of baking; just cover and refrigerate for up to 24 hours and bring it to room temp before sticking it in the oven. Feel free to experiment with different cheeses. I like to use Swiss Gruyere and Parmigiano Reggiano because they both have lots of flavor, so you’ll use less of it. Heat a deep non-stick pan or skillet over a medium high heat and working in batches, wilt the spinach (no oil necessary) until the leaves are bright green – transfer them to a strainer. Squeeze as much moisture out of the spinach as possible then roll it in a towel to remove any residual liquid. Heat the grill/broiler and char the peppers until blackened all over, turning frequently. Put them in a sealed Ziploc (plastic) bag; seal the bag and let them steam for 10 minutes to loosen the skins. Slip off the skins; discard the stalks, seeds and white membranes then slice the peppers into ½ inch (13mm) wide strips. Melt the butter and oil in a heavy skillet/frying pan and sauté the leeks, shallot and garlic until soft – approx 5 mins. Remove from the heat. In a bowl, whisk together the cream, eggs, salt and black pepper, then fold in all the cheeses. Combine the spinach, leeks, shallots, garlic and two thirds of the pepper strips (reserve 1/3 for the topping). Pile everything into a well buttered gratin dish. (You can make it ahead to this point – keep it covered and refrigerated and bring to room temp for baking). Pre-heat the oven to 350F (180C). Bake the gratin for approx 50 minutes, or until a sharp knife inserted in the center comes out clean. Arrange the remaining pepper strips across the top of the dish to serve. I make a similar version frequently for Sunday brunch. I lighten it up using more eggs and remove half of the yolks and 1/3 cup of half and half instead of the cream. Its always a hit! That sounds really good for a brunch dish….I deliberately cut back on the eggs here, to make it more veggie-intense as a side dish but I can see how a lighter version would be delicious – thanks for the suggestion!